These decisions are sometimes made independently of one another whereas others require prioritization and compromises. Hearing instruments are designed to amplify sound which can reduce the effects of hearing loss by making soft sounds audible, average sounds comfortable, and very loud sounds tolerable. All hearing aids have a microphone to collect sound, an amplifier to filter, process, and increase the volume of sound, and a receiver to channel the sound toward the eardrum. It is important to keep in mind that no hearing aid can restore normal hearing. Hearing aids can make soft sounds louder and listening easier. Many factors play a role in achieving maximum hearing benefit including: type of hearing loss, severity of hearing loss, individual listening needs and an individual’s personal lifestyle. The technological advances in amplification engineering and design have progressed significantly over the last decade. Amplification technology is forever changing and improving. 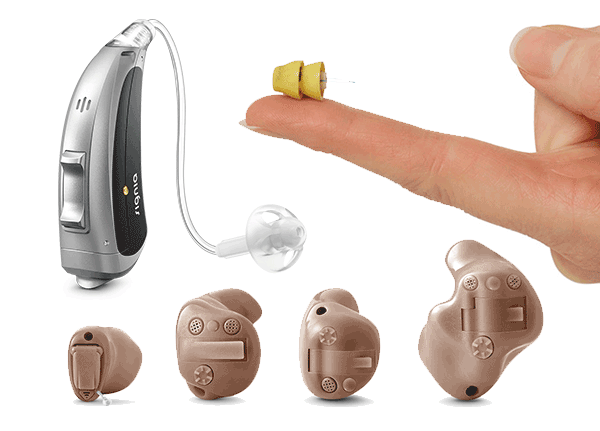 Sophisticated designs, speech enhancement features, noise reduction capabilities, feedback management systems, remote control, and Bluetooth compatibility, combine to bring added value to the numerous variety of hearing devices available today. There are many decisions to be made when selecting hearing aids. Making this important choice should be a team effort involving you and your hearing healthcare professional, following a complete audiological assessment and hearing aid evaluation.